Paid community memberships. This plugin integrates the PaidMembershipsPro plugin into PeepSo’s registration and navigation, giving users a seamless registration experience. On registration, members are offered a list of membership plans. The plans are configurable via PMP plugin’s settings. Just as membership pages are. Once members have chosen their plan, they can complete their registration and confirm their email address. They’re logged in. 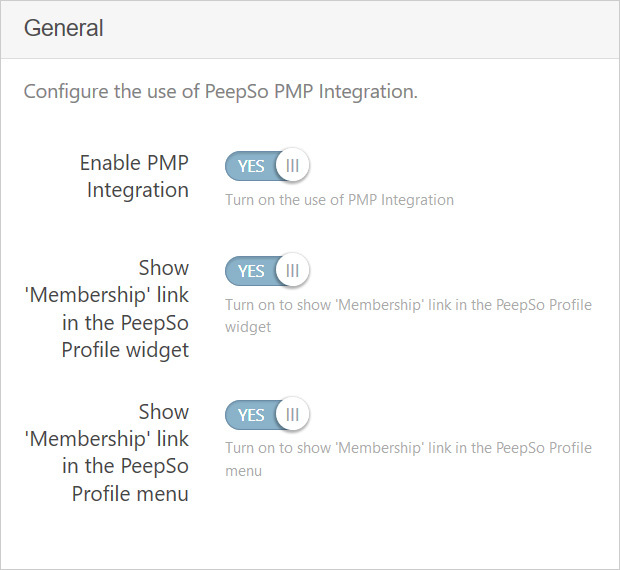 Admin can also choose to display a link to the PMP membership page as a sub-menu of the profile menu on the PeepSo toolbar. Set the desired access level on all pages containing PeepSo Shortcodes except for the ‘Activity’, ‘Registration’ and ‘Password Recovery’ pages. You can also hide the activity stream from non-logged in users in PeepSo, keeping your community totally private. The focus of the plugin is on seamless navigation and a smooth registration experience for users. Registration and membership selection is now one easy step. Seamless registration process where users sign up through PeepSo and can pick their membership level. Seamless navigation, access to membership options is available via PeepSo Profile Widget as well as toolbar.